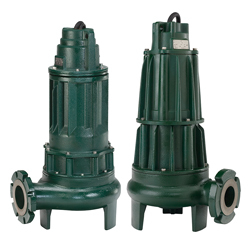 Zoeller Engineered Products manufactures a selection of 1- to 20-hp submersible wastewater pumps, available with a 3-, 4- or 6-in. discharge size, passing up to 3-in. solids using either a semi-open or vortex impeller, and constructed with tandem shaft seals. Oil-filled motors and heat-dissipating finned motor housings make these pumps run cool. They will pass solids up to 3 in. using either a semi-open or vortex impeller. For hazardous locations, the pump can be provided with an explosion-proof motor.